In the fast paced recruitment industry, it can be challenging for agencies to stay in control of staff, job listings, client needs and all the other demands of job placement. 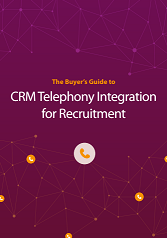 To stay on top, recruitment companies need to take advantage of appropriate tools and technology – like call recording – to increase efficiency and reduce turnover. How can call recording help the recruitment industry?